It is time for us to revisit the biomechanical model. To understand why it is time to move beyond what has become the traditional approach to diagnosis and treatment, it helps to understand a bit of history. biological systems. This mechanistic approach emphasized the relevance of levers within and as part of the musculoskeletal system as a means to comprehend force generation. Because this conceptual model represented the physical structure and its function only, it excluded psychological and social factors, focusing exclusively on the physical features of force transmission in an attempt to understand movement. This model dominated in explanations and demonstrations of kinematics of the human body. Despite its limited scope, the biomechanical model remains one of the foundational principles in orthopedic and rehabilitation medicine. Modern day practice of this model surmises that isolated joints, muscles, tendons, ligaments, and nerve structures operate as independent levers and pulleys, creating the main architectural framework for human movement and functioning-Man as machine. In adherence to this model, diagnostic rationale seeks to explain dysfunction of specific regions of the body based on the presupposed mechanical functioning or disruptions within this force generation and transmission model. Utilizing this mechanical model in clinical practice, once the dysfunction is identified, specific targeted interventions such as localized manipulation, trigger point injections, and joint replacements, are applied. This myopic approach therefore creates subspecialty fields, where expertise is defined by a specific body part (e.g. hand therapy). These clinical specialists train and practice in their areas of specialty providing isolated therapeutic assessments and interventions which perpetuate the idea of the body parts as isolated, independent structures. Anatomical dissection and labeling of parts is another form of reductionism and has been a means to describe the human form for over two millennia. Via the scalpel of the skillful dissector who determines where one structure stops and another begins, we have explained and constrained the human form into the biomechanical framework. Whom amongst us in the medical professions hasn’t spent countless hours in the anatomy lab, separating and isolating structures to reach the ultimate goal of labeling them as parts? Using this approach, the exposing, separating and labeling of tissue, has unfortunately led to an artificial representation of the actual connectivity of our underlying structures necessary to truly understand functional movement. Due to the hydrophilic nature of the connective tissue system, the drying, preserving and processing of tissue in preparation for dissection limits our understanding of what the tissue actually looks like and, more importantly, moves like in living, functioning human beings. Today’s progressive scientists studying connective tissue are beginning to advocate for a change in this way of examining the body. The modus of anatomy training in most major educational institutions, however, has remained traditionally oriented-one of the study of parts and separation. Over the last few decades, the fascial system has been increasingly recognized as an important system for understanding mechanical force generation. For instance, connective tissue studies are confirming that the endo-/peri-/epimysium which surrounds and permeates our muscles and muscle fibers are responsible for up to half of the force transmission, greatly augmenting the muscle/tendon attachments that previously were thought to be the sole driver in movement and propulsion. ‘The fascial system is made up of a three-dimensional continuum of soft, collagen containing, loose and dense fibrous connective tissues that permeates the body. It incorporates elements such as adipose tissue, adventitiae and neurovascular sheaths, aponeuroses, deep and superficial fasciae, epineurium, joint capsules, ligaments, membranes, meninges, myofascial expansions, periostea, retinacula, septa, tendons, visceral fasciae, and all the intramuscular and intermuscular connective tissues including endo-/peri-/epimysium. The fascial system surrounds, interweaves between, and penetrates all organs, muscles, bones and nerve fibers, endowing the body with a functional structure and providing an environment that enables all body systems to operate in an integrated manner’. Despite centuries of neglect, it has become hard to ignore the fascial systems continuous global and three dimensional properties. The health or potential dysfunction of this system would most certainly have a broad influence on global structures of the body, including the nervous,lymphatic, circulatory, and the endocrine systems. A 2018 study published in Scientific Reports by Neil Thiese described the loose connective tissue as the Interstitium. Some in the media described this as a ‘discovery of a new organ’. This study observed the macroscopically visible spaces within tissues via focal microscopy — noting the dynamically compressible and distensible sinuses through which interstitial fluid flows around the body. Thies stated that the findings of this study necessitated reconsideration of what we understand as the normal functional activities of different organs. He describes how these observed anatomic structures are potentially important in cancer metastasis, edema, fibrosis, and mechanical functioning of many or all tissues and organs. Fascial and biotensegrity researchers understand and have been studying this fibrous web of tissue for sometime and noting that it is directly connected to the skin layer and penetrates down to the cellular level. The collagen and elastin fibers within this connective tissue give fascia its shape and structure. The fibers are lined up based on the directional lines of force generation within the body. Repetitive motion, overuse, and injury can cause the fibers to become disorganized and dense, preventing smooth coordinated movement. For example, if your hamstrings are tight, it might not be because they are over contracted or short – it may be the fascial fibers are constricted and imbalanced in the particular lines of pull within the connective myokinetic chain of which the hamstring is part or in its neighboring structures which may be influencing the glide of the localized structures. This restriction may have a negative effect on the muscle receptors ability to fire correctly, which would then limit the concentric and eccentric motor control. The resultant effect could be limitations in range of motion, strength or global restriction in motor planning and functional coordination. This way of understanding the human body can be applied to practical rehabilitation goals, aiming to create symmetrical compression and distraction balance throughout the bodywide system. Three dimensional balance allows the joints, muscles, tendons, venous and arterial flow, nerves, and lymph and fluid flow to operate optimally and maintain homeostasis. With Thiele’s new imaging research on the interstitium along with neo-anatomical research with fresh connective tissue, we may better be able to advance our understanding of this continuous network. Rejecting the simplistic and reductionistic biomechanical model while embracing the more complex and elegant bioetensegrity model opens the door for new diagnostics and treatment interventions in clinical practice. Pope MH. Giovanni Alfonso Borelli–the father of biomechanics. Spine. 2005;30(20):2350-5.
 https://www.researchgate.net/publication/320742664_Fascia_- _The_unsung_hero_of_spine_biomechanics [accessed Jan 22 2018]  Adstrum S, Hedley G, Schleip R, Stecco C, Yucesoy CA. Defining the fascial system. J Bodyw Mov Ther. 2017;21(1):173-177. Theise ND. Structure and Distribution of an Unrecognized Interstitium in Human Tissues. Scientific Reports. 2018;8:4947. 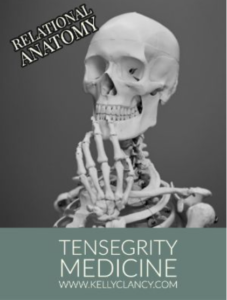 (This is an excerpt from Kelly’s upcoming book on Tensegrity Medicine- A treatment approach addressing the whole person – body, mind and spirit in traditional medicine).